A Waymo's safety driver was threatened at gunpoint. The streets are becoming unsafe for self-driving cars. Police have responded to “dozens of calls regarding people threatening and harassing Waymo vans,” Arizona Central reports. 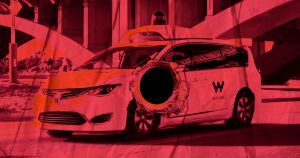 There have at least 21 incidents, according to the news report, in which safety drivers — human “passengers” behind the wheel, assigned to oversee the driving of each of Waymo’s autonomous vehicles — were harassed in some way or another. The news comes after the Alphabet-owned company recently launched the first-ever self-driving taxi service for paying customers in Arizona. The abusive behavior includes motorists yelling at Waymo’s cars, throwing rocks at them, or slashing their tires. There was even an incident where a bearded man pulled a handgun at a Waymo safety driver. “We believe a key element of local engagement has been our ongoing work with the communities in which we drive, including Arizona law enforcement and first responders,” reads a statement from Waymo, sent to Arizona Central. Safety drivers are trained to handle these kinds of situations, and are instructed to call Waymo before 911, depending on the situation, according to police reports. So why all the hate? A lot of the reported incidents involved people who were heavily intoxicated or, in the instance involving the handgun, suffering from dementia. But why Waymo in particular? A lot of the discontent stems from Waymo’s position in the market as a company that’s planning on taking people’s jobs, according to information technologies lecturer at Arizona State University Phil Simon. “This stuff is happening fast and a lot of people are concerned that technology is going to run them out of a job,” Simon told Arizona Central. “There are always winners and losers, and these are probably people who are afraid and this is a way for them to fight back in some small, futile way,” says Simon.